There is a writer/farmer, Eliot Coleman, how lives in Maine. For years he has raised vegetables through the entire year there, with just a break between Christmas and New Year. Most amazing, as he grows in mostly unheated hoop houses, and is really the father of what you see so many of these all over the country. And city too! He discovered through trial and error that many things can be grown through winter. And many things cannot. 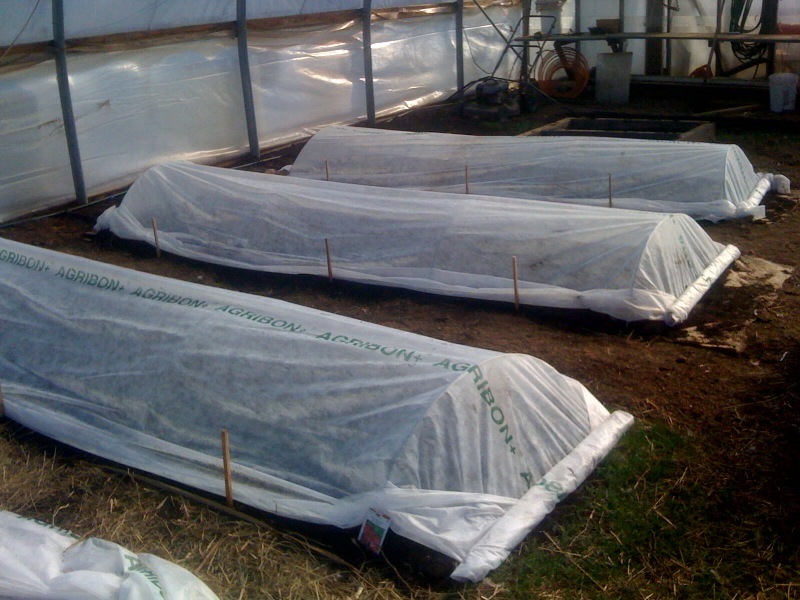 So here is our hoop house, plastic covered, and then fabric row covers over metal hoops over the vegetable beds. 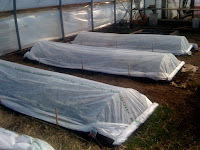 These 2 layers keep the air just around the vegetables warm enough that they survive even sub-zero temperatures. Combined with seed sowing in August/September, we can have vegetables all year long. Fresh. No heating bill. Just the warmth of the sun. Thanks for being the pioneer Mr. Coleman!